WASHINGTON–The 2016 Iniskin earthquake (magnitude 7.1) that shook Anchorage, Alaska, was captured by the seismometers of the EarthScope Transportable Array. This data is helping Geoff Abers, a professor at Cornell University’s Department of Earth and Atmospheric Sciences, and Michael Mann, a graduate student in his group, explore answers to fill crucial gaps in understanding intra-slab earthquakes. Their work may provide insight into the November 30, 2018 magnitude 7.0 earthquake near Anchorage. It could also help improve earthquake hazard assessments in the future. Intra-slab earthquakes usually occur deep in the earth, within tectonic plates descending into the mantle at subduction zones. Because they are so deep, intra-slab earthquakes can be large magnitude and felt over a broad area; however, they usually don’t exhibit strong seismic wave acceleration or ground motion since the fault causing the earthquake is deep. Iniskin was different. The Iniskin earthquake originated within the Pacific Plate, which is slowly being forced under the North American Plate. “The Iniskin earthquake was 125 km deep, but caused some very high ground motion that was felt and recorded in Anchorage, and in particular where there’s a dense network of accelerometers. When it occurred in 2016 it was actually the strongest ground shaking in Anchorage since the great 1964 earthquake that destroyed half the town,” said Abers in early November, before the damaging earthquake of November 30. The Iniskin earthquake was more than 270 km from Anchorage. The magnitude 7.0 earthquake that occurred on November 30 was also an intra-slab earthquake within the subducting Pacific Plate, but it was only 44 km deep and only a few miles from Anchorage. It produced extensive damage, and while initial data are still being processed, it serves as a reminder of the hazard posed by this kind of earthquake. The Iniskin earthquake provided a prime opportunity to study the mechanics of an intra-slab earthquake, and how local geology can dramatically change the earthquake’s effects. 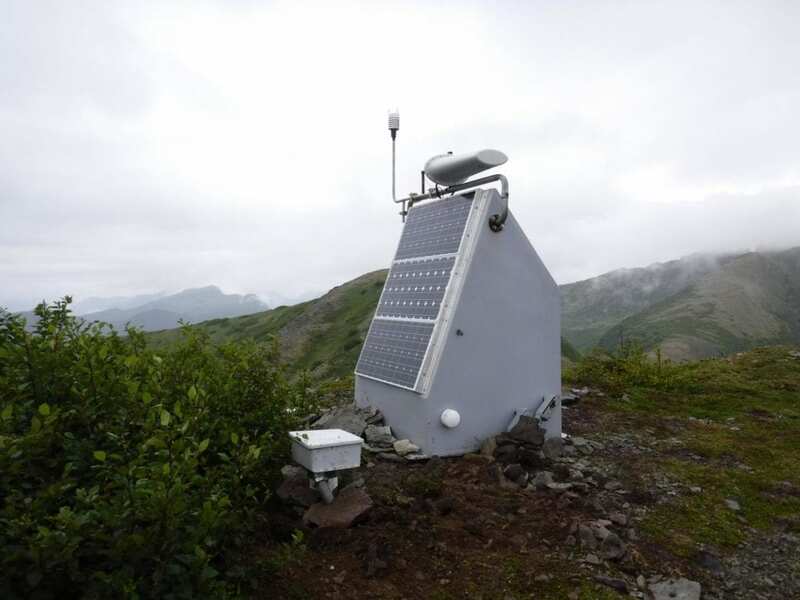 The Iniskin earthquake rattled Anchorage shortly after seismometers from EarthScope’s Transportable Array were installed in southcentral Alaska. The Transportable Array consists of hundreds of seismic stations deployed in a grid; it has leapfrogged its way every two years across swaths of the continent for more than a decade and is currently in Alaska. The grid, with a spacing of about 85 km, covers Alaska from the southeast panhandle to the North Slope. “We are only able to do this study because the Transportable Array installed high-quality, state-of-the-art instruments in many otherwise inaccessible places,” Mann said. “We’ve known for some time that you occasionally do get big intra-slab earthquakes and there’s been some concern they are underrepresented globally in hazard estimates in the places in the world where they occur. So this is an opportunity to delve a little bit deeper to try to understand what was going on here,” Abers said. What caused such unexpected movement from the Iniskin earthquake? Abers and Mann think there are two possible factors based on local geology: one is the temperature of the mantle the seismic waves travel through to reach the surface, and another is that the seismic waves can sometimes ricochet between the layers of a subducting tectonic plate. Anchorage sits near the edge of the North American Plate, where the continental plate pushes the Pacific Plate down into the mantle. The plate from the surface is cooler, and therefore more solid, than the surrounding mantle, so seismic waves travel faster. The Transportable Array allowed a comparison of seismic waves the same distance from the source of the earthquake, but in different directions. North of the Alaska Range, where the distance from the subduction zone means the crust lies above the mantle, the seismic waves have to travel through hot mantle to get to Anchorage. The heated rock is softer and “mushier,” so seismic waves don’t travel as quickly as through cooler crust. The other possible reason why the Iniskin earthquake shook the ground so much has to do with the local structure of the crust. Abers and Mann found that at some frequencies, seismic waves seemed to be amplified. The crust is made up of multiple layers of different kinds of rock. If a weaker layer is sandwiched between stronger layers in the sinking crust of the subduction zone, seismic waves may travel up the subducting plate and be caught in the sandwiched layer, bouncing back and forth and amplifying the wave’s energy. “We’ve known about this problem for a while, but it hasn’t really made it into how hazards are assessed from these earthquakes very clearly, because we haven’t worked out how to determine the parameters,” said Abers. In places such as Anchorage, earthquake hazard assessment may need to include information about the deep earth, tens of miles down, and not just the near-surface geology. Puzzling out what happened during the Iniskin earthquake and possibly the November 30 one, and having good data coverage to compare the earthquakes from different locations, is a step forward for improving hazard assessment for intra-slab earthquakes in the future.